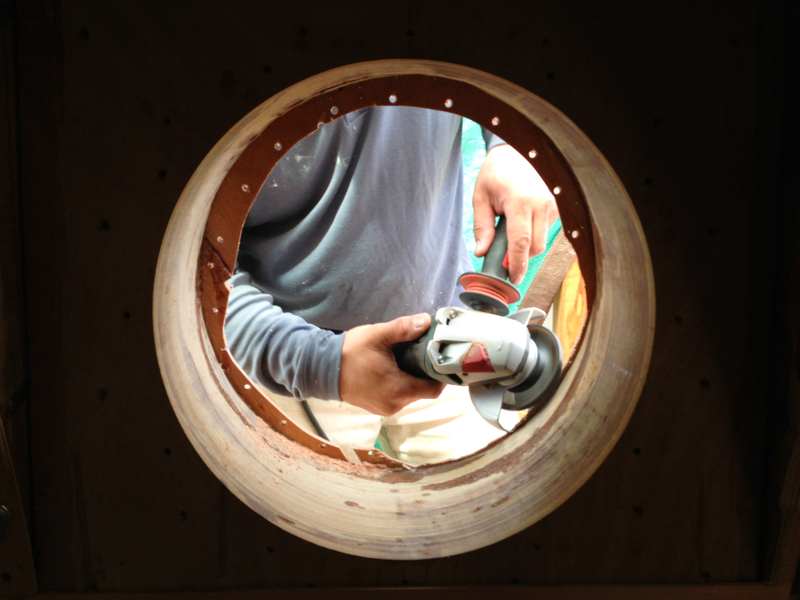 Using a long drill bit, drill from the inside of the boat, through the porthole opening. All steps are designed t gradually “get to” the correct shape of the opening and not try and do it too fast. These holes are drilled a “safe” distance from the very perimeter of the opening, and not right up on the perimeter like I did the first couple of times. With the holes a safe distance away from the final hole we want to make, use a skill saw from the outside of the boat and connect the dots to release a roughed out circle. Using a grinder and a microplane attachment (which I love), trim away the majority of the new plywood layer. This is super fast. A drill and a drum sanding attachment (also awesome) brings the new layer into alignment with the rest of the porthole opening. Originally I tried to do all these steps quickly with a router and a flush-trim bit. Sounded good, but in practice… the bearing kept getting caught, finally spinning off the router completely. Not only bad for the bit, but the bearing was digging into the opening as well. This is just one of those things. When everything is rounded, you can’t always thing like you would with straight edge projects. * Special thanks to my friend Turroo, who cut this hole and has been helping a few times with this layer of skinning.